Annie's Gardening Corner: What’s in your Soil? This year’s garden seems like it is on steroids. Everything is growing in massive size. It could be a number of factors, including the weather but we conclude that in large part, it is the rich compost we have been mixing with our soil. When that smelly pile shows up from a local farm, besides the dogs being in 7th heaven, it’s time to start improving the soils. Bringing this up now may seem like an afterthought because you may think you are past that point in your garden. This tidbit is for anyone still turning over a new planting area and prepping the soil. It can also serve as a reminder for those watching what is happening in their gardens now and to make note for next year. Soils vary even within a small radius. It is important to understand what is in your soil and what prep work is required in getting it to its highest level. If you want success, good growing conditions start from the ground up. Some of you may not opt for the local farm’s manure. You may only have a small area so that rich compost may be overkill. A good choice is the bagged manure for those small plots. For those who have sizeable areas and are serious about getting good vegetables and healthy plants, then consider testing your soil for pH, nutrients and texture. If you planted this year’s crop and you aren’t seeing a good success rate, it may make sense to assess your soil. There are many universities that offer local extension programs and testing. We are fortunate to have the University of Massachusetts, a top-notch reliable source. Here is the link for their services and testing fees. There were a lot of choices for today’s inspirational thought but a quote from Xenophon, Oeconomicus, 400 B.C. 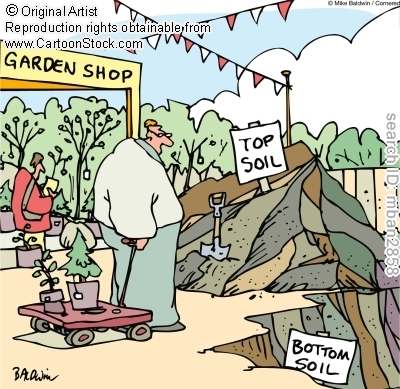 truly shows the importance of understanding soil. “To be a successful farmer one must first know the nature of the soil.” So don’t fret and throw in the shovel. Understand your soil and delve into its contents.